I love lighthouses and on a recent trip to the Georgia coast we went on a quest to photograph each lighthouse. I was pleasantly surprised to find several unique lighthouses near the area where we were staying. After further research, not only did I find unique lighthouses but lighthouses that had interesting historic stories. Some lighthouses survived the civil war and others were rebuilt after the war. One unique lighthouse has a legend of the "waving girl" who greeted vessels for over 46 years. In all I was able to photograph four different Georgia lights and this lens will detail my visit to each of these lights. 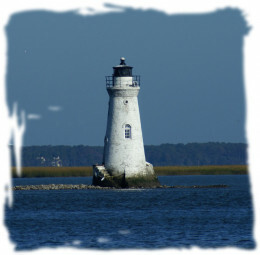 The lighthouse at Tybee Island is Georgias oldest and tallest lighthouse. 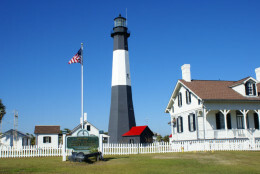 The lighthouse is located several blocks off the northern end of Tybee Island. We drove around it several times looking for the right angle to photograph the lighthouse without getting all of the wires and other buildings in the photos. It is a stately looking black and white lighthouse that appears to be very well maintained. The lighthouse and towers at Tybee Island have had a lot of bad luck over the years. The first tower was built off Tybee in 1733, but it soon collapsed in a storm. The second tower's life was cut short by encroaching seas and a third tower was constructed in 1773. At first these towers only helped navigation in the daylight, since they were not lit. The third tower was lit in 1790. In 1862 the Confederate forces torched the lighthouse to prevent the Union troops from using it. In 1886 a rare earthquake badly damaged the lighthouse. In 1867 the lighthouse was reconstructed using the 1773 structure as a base. It's First Order Fresnel Lens is still in use today. 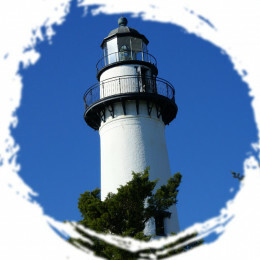 The lighthouse has undergone several reconstructions during modern times making it one of the best maintained lighthouses in the United States. You can read more of the interesting history of the Tybee lighthouse in the link below under Great Links on Georgia Lighthouses. I had read about a light in Savannah harbor that appeared to be more of a giant streetlight than a lighthouse, so I was anxious to see it. We were driving in downtown Savannah and I was describing the light to my husband while we were at a stoplight. I remembered it was on Bay street and just then I looked up and saw what I thought might be the light. My husband wasn't so sure, but he pulled into the park where it stood and sure enough it was the historic Savannah harbor light. 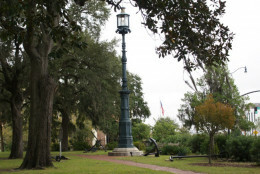 It is a beacon light that was erected in 1858 to aid in navigation on the Savannah river. It stands 77 feet above the river level and was illuminated by gas. It is a dark green metal and does look like an old fashioned street lamp. I was able to get several photographs of the light. The setting was perfect with the moss hanging off the trees. It seems to fit so well with the character of Savannah. The lighthouse at Cockspur Island marks the entrance to the south channel of the Savannah River. Cockspur Island is just off the coast from Fort Pulaski and can be seen on the drive between Savannah, GA and Tybee Island. I could see the lighthouse from the bridge but was uncertain how I would get a good photograph. After some searching we found a small road that led back to an area where I could put on my telephoto lens and capture some great shots of this historic lighthouse. The first lighthouse was built at Cockspur in 1736 and the current light was built in 1857. Although the lighthouse was right in the midst of a civil war battle it was able to survive the war. Lighthouse Friends details the history of the lighthouse and information on the lighthouse keepers over the years. One interesting legend of the lighthouse is called the "waving girl". In the legend the lighthouse keepers sister greeted vessels passing the lighthouse with a wave of her handkerchief during the day and by waving the lantern at night. The light at St Simons island is 104 feet tall and has a brick keepers house in front of the lighthouse. It is a working lighthouse that along with the keepers house (now a museum) is open to the public. The tower has 129 interior steps. The lighthouse has an interesting history. 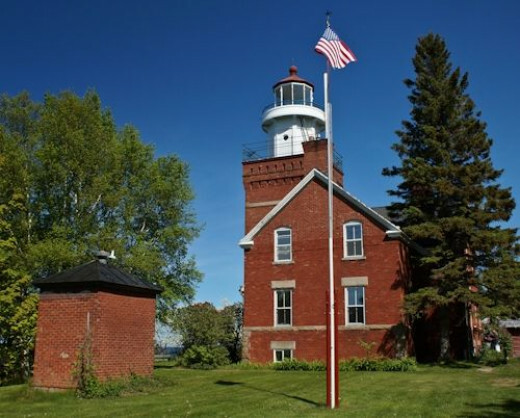 One lightkeeper was murdered on the grounds when he had an disagreement with his assistant. 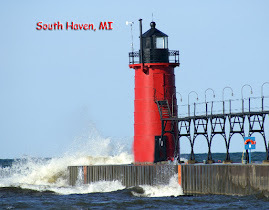 Another lightkeeper and his wife kept hearing unexplained footsteps in the tower, which sent their dog Jinx into a frenzy. To this day people still talk of hearing strange footsteps in the tower. Read more about the history in the link from lighthousefriend.com in the section Great Links on Georgia Lighthouses. I enjoyed our visit to St Simons island. It is a nice beach town with a street of tourist and artsy shops. A great place to visit and spend an afternoon! If you love lighthouses you might want to consider the ultimate treat for a lighthouse enthusiast, spending some time at a lighthouse bed and breakfast. I have visited many lighthouses and climbed to the top of a few, but I can tell you nothing quite gives you the true lighthouse experience like spending the night in a lighthouse. 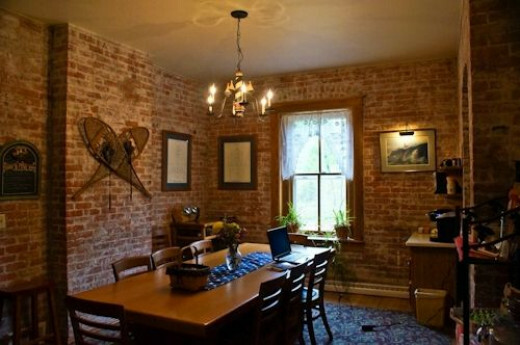 We had stayed in a lighthouse in Minnesota and enjoyed the experience so when we decided to take a trip to the UP ( Upper Peninsula of Michigan) I looked into lighthouse bed and breakfasts in the area. I found there were three different ones available: Sand Hills, Jacobsville and Big Bay. Although all three lighthouses looked great we decided to spend two nights at Big Bay lighthouse. It best fit our needs and travel plans. If you want to enjoy a delightful secluded retreat away from the hustle and bustle of everyday life, Big Bay Point is a perfect place to stay. 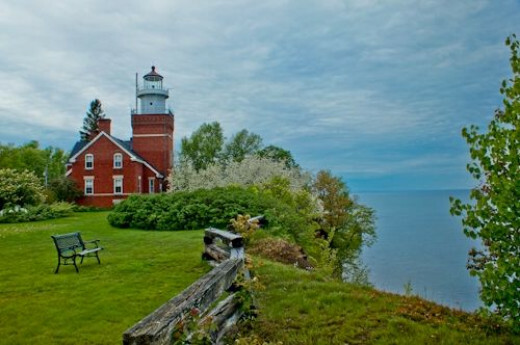 It sits high atop the bluffs on a cliff that juts out over Lake Superior. I enjoyed climbing the lighthouse tower whenever I wanted, relaxing in front of the fire in the cozy bedroom, walking the grounds and enjoying the scenery and waking up to a wonderful country style breakfast. On this page I will share with you some information on Big Bay Point lighthouse and my experience at this delightful bed and breakfast. When we arrived at the lighthouse we were met by one of the owners, Jeff, and given an orientation tour of the lighthouse. Jeff showed us around the main floor. In the kitchen we were shown the guest refrigerator to keep any of our supplies and where we could find glasses and ice. In the dining area was a beverage area where we could help ourselves to coffee and other hot drinks and light snacks. 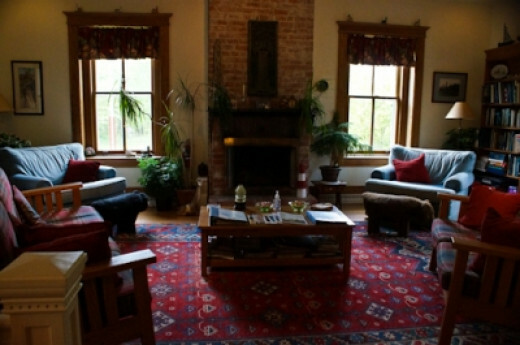 The living room area included a cozy sitting area around a fireplace and bookshelves full of books. I noted there where many books about lighthouses and also a lot of travel books. Jeff told us how to get to the lighthouse tower and we were told we were free to climb to the top of the tower whenever we wished. At the base of the tower there is a sauna which is available to the guests and also a small library. The library has a TV with both satellite reception and DVD's that we could watch. It also has a wide selection of books that can be borrowed or traded. Next Jeff took us to our room. Our room was on the main floor and was beautifully decorated in lighthouse decorations. It had a queen size bed, a gas fireplace, and two comfortable chairs to sit and read or enjoy the views of Lake Superior from the three large windows. It also had a private bath. After our tour we felt very comfortable with our surroundings. Jeff then told us that his wife would give a talk on the history of the lighthouse and some information on places to eat and things to do in the area later that day. At 5 we went to the sitting room to join the other guests to hear about the history of the lighthouse and the area from Linda. The lighthouse was originally put into operation in 1896. Ships had often wrecked along the shores of the dangerous waters just to the north of the Huron Mountains so the government established the lighthouse at Big Bay Point to help guide the ships. The original 3rd order Fresnel lens filled the entire light room and could be seen by ships from 18 miles away. Linda gave us information about the keepers of the lighthouse through the years and what their lives must have been like on this remote point. The lighthouse originally was set up as a duplex for a lighthouse keeper and an assistant keeper and their families. There were many children raised at the lighthouse and at one point between the two families their were 14 children. There was no electricity at the lighthouse until the 1940's so oil had to be brought up to the lantern to light the lamp. Each of the families at their own outhouse on the property. Linda told us that she and her husband Jeff have been running the lighthouse bed and breakfast for 22 years. 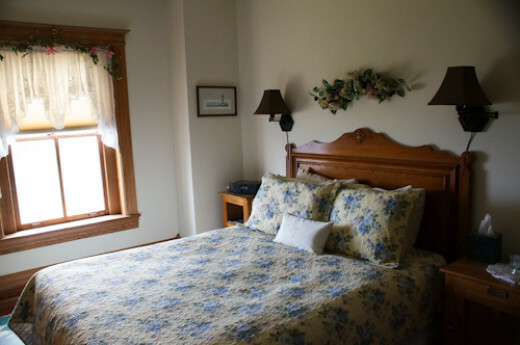 The lighthouse was turned into a bed and breakfast in 1986 and is found on the National Register of Historic Places. The lighthouse has 7 guests rooms with private baths and some also have fireplaces. There are two bedrooms on the first floor and 5 on the second floor. Breakfast is served family style each morning from 8-10 in the dining room. The breakfasts we had were wonderful. On the first morning we had raspberry scones, fresh fruit, Florentine scrambled eggs, bacon and biscuits. The second morning we had coconut muffins, fruit and yogurt cups and banana pancakes. There was also an array of drinks, cereals and yogurt available. Everything was delicious! There are also fresh baked cookies available to snack on throughout the day. This pretty room has light blue and white colors with lots of lighthouse dÃ©cor. On our first afternoon at the lighthouse, I took a walk on the trail that goes from the lighthouse along the bluffs of Lake Superior and then circles through the woods back to the lighthouse. 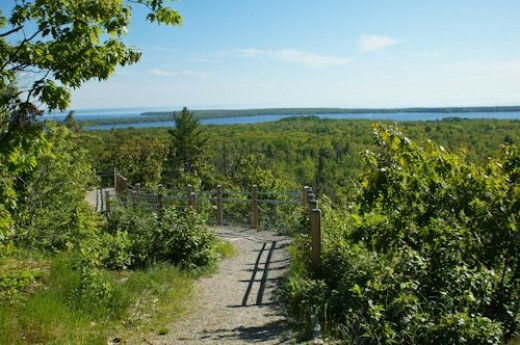 It is about 1/2 mile trail that gives you some beautiful views of the lake and bluffs as seen in the photo above. I was by myself when I took the walk and this photo, but I'm sure if someone saw me it would have been quite comical. I was a bit intimidated by the steep bluffs, so I held on tight to a birch tree with one hand and maneuvered my camera with my other hand to get this photo. I tend to get quite involved in my photography and I could just see myself stepping too close to the bluffs if I hadn't clung to the tree. One of the joys of staying all night in the lighthouse is being able to climb up to the top of the tower whenever you wish. The steps up to the tower ascend from the second floor library room. From there you climb a spiral iron staircase that leads you to the top of the tower. I found the climb to be an easy climb and the view up top to be stunning. In this photo you see the view looking to the east. You see the grounds of the lighthouse and Lake Superior. I am told that sunrises and sunsets are particularly stunning from up on the tower. Both evenings were too cloudy to enjoy a good show when we stayed so I didn't get that experience. It was also mentioned that seeing the Northern Lights from the tower could be quite spectacular. In the 1950's a murder took place in the Lumberjack Inn in Big Bay. This murder became famous when the accused was found not guilty by reason of insanity. That was the first time the insanity plea was used successfully in the state of Michigan. This true story was written in a book by Robert Traver and later producer and director Otto Preminger made it in to a film starring Jimmy Stewart and Lee Remick. It was filmed in the Thunder Bay Inn in Big Bay. Both the Lumberjack Inn and the Thunder Bay Inn are still in business in Big Bay. We had pizza and beers at the Lumberjack Tavern our first night at Big Bay and dinner at the Thunder Bay Inn on the second evening. Both are very popular eating establishments in the small town. 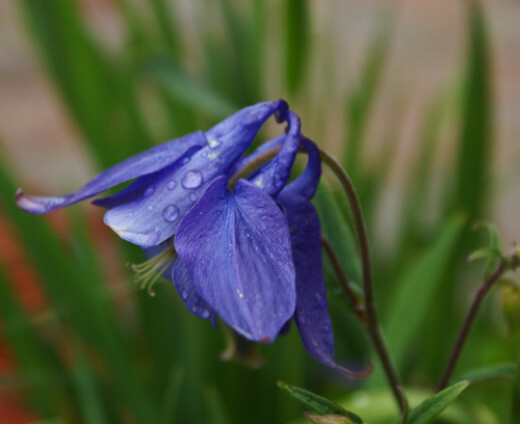 This Columbine was photographed just after a rain shower. Are you ready to book your stay in a lighthouse? The link below provides all the information you need to book your special lighthouse adventure. If you enjoy nature you will love the opportunities at and around Big Bay. This photo was taken at the Thomas Rock overlook which is just a few miles outside of the town of Big Bay. The overlook has a great accessible path that is 1/4 mile long and leads up to the overlook. 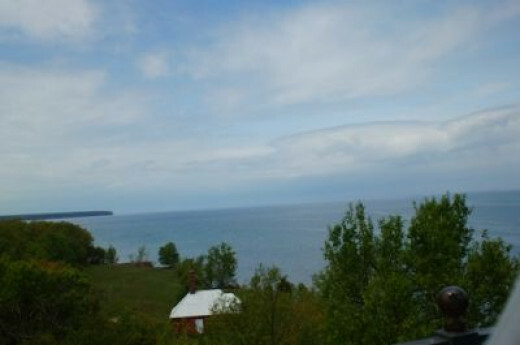 From here you can see several lighthouses, and a wonderful view of both Big Bay and the Huron Mountains. There are also several waterfalls to explore in the area. About 6 miles away you will find Yellow Dog Falls and a short distance further down the road will be a trail to Big Pup Creek Falls. These are wonderful plays to explore and you may even see some otters playing near the falls.